For the past 10 years, Asocacion Tierra and La Mariposa have had poverty reduction as a central focus. Helping improve education and health are critical but it is hard on people to be healthier and better educated but not be able to find a job!! La Mariposa itself has focused intensively on employment creation without forgeting health and education…each of our iniatives has been accompanied by an increase in the number of jobs. It is also our policy to promote people from the local community so La Mariposas management team is “puro pinolero” – 100% Nicaraguan and local. So local that most of the workers walk or ride bikes to work, which also has the advanatge of being healthier. Asociación Tierra has one worker from the US whose job is to fundraise. We also help our workers to progress in whatever ways possible…supporting their studies for example. Chepe (below right) is being funded to study veterinary science. Below left is the management team. We support employment iniatives in the community and have funded the complete building of a womens cooperative at a cost of over $10,000. The women had received training in running a bakery business but had nowhere to do it! Now it is up and running and of course we are one of their best customers! We have also paid for the electricity installation in a second womens cooperative which produces healthy cereal drinks – below, building the bakery and then baking in the bakery! Whenever we need outside help we always employ a local person…the talents and abilites often hidden away are amazing. Below is Luis, a Spanish teacher, who also turns out to be an excellent artist – here painting new signs for one of our nature reserves. There are many other ways of helping out people and families who are going thropugh particulary hard times. We have replaced a roof lost in a storm, rebuilt a house wall which collapsed in an earth tremor, built a one room house and found work for a young single mother with no other form of support. There are a number of children and young people who go to school thanks to the help Asociación Tierra is able to provide – buying pencils, books, rucksacks – in some cases even clothes and shoes. Several families benefit from weekly donations of vegetables (the healthy option) and from help with essential medicines. We know that families with a disabled member suffer from worse poverty and there are a number of such families who receive weekly help – financial and in kind – from Asociación Tierra, such as Brian in the photo below who lives with his grandfather on virtually no income. An extra and very generous donation helped pay for an operation to restore his vision. Brian, practising on his walking bars wearing new glasses! He also goes to free Englsih classes! Isabel, below, lives with her mother, elder sister plus elder sisters partner and baby in one room. At the age of eight, she had never been to school. Now Asociación Tierra pays for extra classes and all the basics – and she is coming home with straight As! 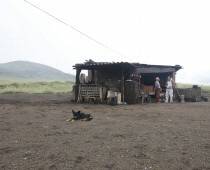 Mum has started to work in La Mariposa so the family now has an income.